Hey guys! It's been some time. Again! Sorry for always being MIA. Life's always has been busy, and I think it will stay the same for quite some time. Anyhow, I am happy I can still drop by to blog from time to time. On today's post. 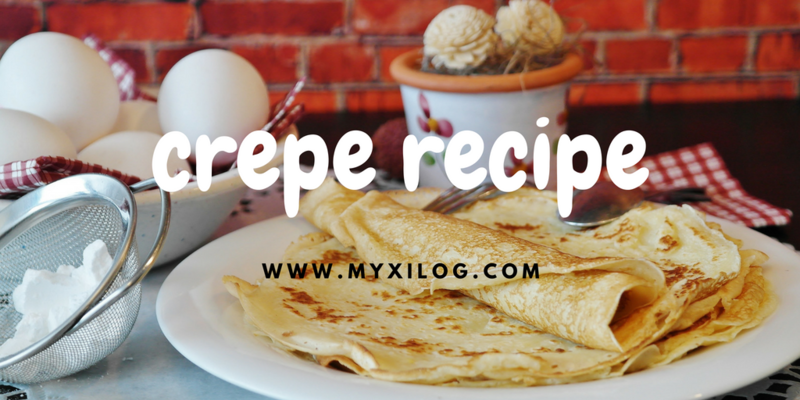 I want to share with you the recipe I am using for making crepe. Since my husband has lived in France for almost a decade, he must have missed Parisian food. And even if he did not, it's okay, I love cooking. So without any dilly dallying, here's the basic recipe I am using. Basically, I just combine all the dry ingredients in one bowl and set it aside. And in another bowl, I combine the wet ingredients and mix them thoroughly. Then, I pour out the wet to dry little by little while whisking it with a wire whisk to prevent any lumps. Some use a sieve and strain them before cooking. I also like resting the batter for a little while before using it. I think, an over night rest is the best. Serves 2. I always use a quarter cup to pour the batter to the greased non-stick pan. There's no trick in this recipe. It just need your patience since it is a little bit of a time consuming dish. (At least that's how I feel.) Hahaha. So yep. Have your crepe batter today and cook them tomorrow. Then, don't forget to update me how it turned out! Play with the filling. They're endless. Adios!